There was certainly no shortage of top performances down at Campanelli Stadium these past two days. On Friday, No. 2 Wachusett rallied to beat No. 6 Lexington, 8-7, on a walk-off RBI single by Barry Walsh. In the night cap, No. 8 Walpole saw No. 5 Mansfield rally from down 7-2 in the ninth, only for the Rebels to retake the lead in the top of the tenth on a Tyler Page RBI double en route to a 10-7 win. Saturday brought with it a pair of upsets. First, seven seed Franklin knocked off St. John's Prep behind a seven inning performance from Bryan Woelfel. Later in the afternoon, Dominic Keegan went 4-for-4 to power Central Catholic past No. 1 BC High, 7-5. Here are our top performers from this weekend's Super Eight action. The Vanderbilt commit was the star of the show this past weekend, belting the go-ahead solo home run to center field as part of a 4-for-4 effort to lead Central Catholic to a 7-5 win over BC High and a spot in the Super Eight semifinals. Going up against a solid St. John’s Prep lineup, Woelfel battled going seven innings allowing just three earned runs on six hits while striking out six. Woelfel finished his outing throwing four consecutive scoreless frames en route to picking up a win in the Super Eight quarterfinals. In his final game as a member of the Minutemen, Frelick shined as he did all season long going 3-for-5 with a triple, 2 RBIs, and two stolen bases in Lexington’s 8-7 loss to No. 2 Wachusett. One inning after bouncing into a double play, Walsh redeemed himself grounding a walk-off RBI single into right field to cap off a four run ninth inning rally by the Mountaineers that kept them alive in Super Eight play. For the day, Walsh went 2-for-6 with two RBIs. Yarin was a potent bat in the middle of the St. John’s Prep lineup on Saturday afternoon going 4-for-5, highlighted by a ninth inning two run home run, with three RBIs. 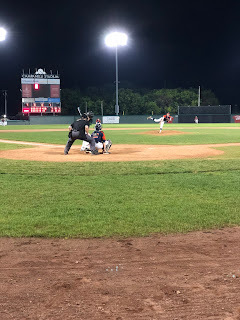 Hitting out of the number nine spot in the Walpole lineup, Falvey had a night to remember in the Rebels elimination game win over Mansfield. Falvey went 4-for-4 with two RBIs, a walk, a stolen base, and a triple. He also scored the go ahead run in the top of the tenth inning. Dow did just about everything he could to keep the Hornets alive on Saturday night, performing both on the mound and at the plate. As Mansfield’s starting pitcher, he turned in a quality outing going six innings while allowing three runs on six hits and striking out five. At the plate, Dow went 2-for-5 with a double and two RBIs. Throughout the course of Walpole's 10-inning win over Mansfield, Page was terrific behind the plate making a game saving block in the bottom of the ninth as well as making a big catch in foul ground in the tenth. Page also contributed the go-ahead RBI double in extra innings. Lucier provided Central Catholic with depth both in the lineup and on the mound against BC High on Saturday afternoon. Out of the seven spot in the order, Lucier went 2-for-4 with 3 RBIs and on the mound the right-hander got the save going three innings allowing no earned runs and just one hit.